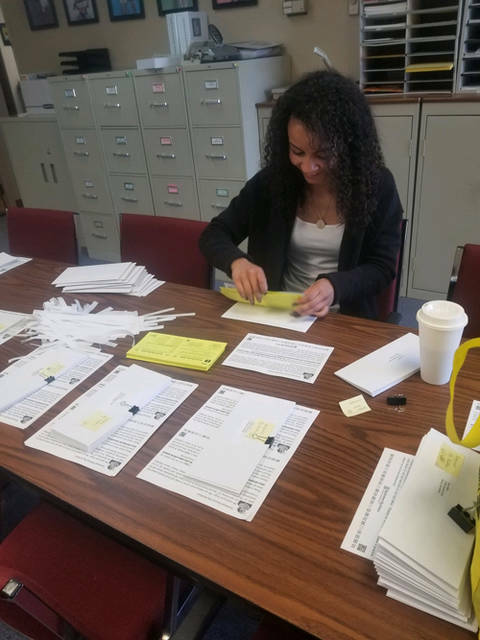 Khalia Free, of Piqua, volunteered her time with Big Brothers Big Sisters of Shelby & Darke County through Edison State Community College’s Business Capstone Service Learning Initiatives Project. Drew Sosby, of Jackson Center, recently became a Lunch Buddies Big Brother with Little Brother Jesiah Webber at Jackson Center Local Schools. Jesiah is the son of Sandra Webber. 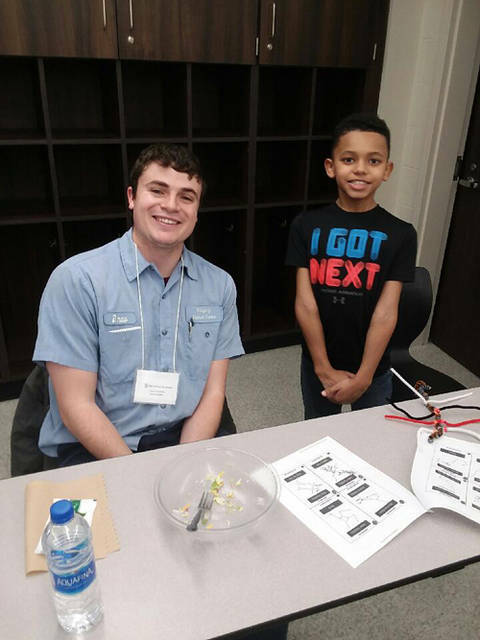 PIQUA – Big Brothers Big Sisters of Shelby & Darke County announced its recent partnership with Edison State Community College students for their Business Capstone Service Learning Initiatives Project. As part of course requirements, students were expected to volunteer their time to local non-profit organizations to help with a particular project. “Each student contributes approximately 15-20 hours to the project, allowing them to apply discipline-specific business skills and improve their communication, interpersonal and analytical skills as they give back to the community,” said Ruth Barney, professor of marketing and business capstone instructor. Drew Sosby, Khalia Free and Kristen Ross chose to volunteer their time with Big Brothers Big Sisters and lent their expertise in various areas. Big Brothers Big Sisters requested students to help with planning, implementing and executing its two annual fundraisers – Bowl for Kids’ Sake, which was held on March 1 and 2, and its 13th annual Duck Derby & Duck-N-Run 5K, which is coming up on June 20. Students were evaluated based on their effort level, professionalism, communication and the agency’s overall satisfaction with the completion of the project. Sosby, a Jackson Center resident and graduate, took a different approach to the project and actually made a long-term commitment to being a Lunch Buddy at Jackson Center Local Schools. Lunch Buddies is a one-to-one mentoring program in which adult volunteers are matched with a second or third grade student. Volunteers eat lunch with the students, assist with school work and play games all while building a positive friendship. Lunch Buddies students are referred by their teacher, school guidance counselor or other school personnel. Lunch Buddies takes place every Wednesday throughout the academic school year for approximately 30 minutes during the student’s lunch break. “The main reason I wanted to be a Lunch Buddy was because I feel like it is important to give back to your community and it is important to become involved in something that has made a difference in your life,” Sosby said. All three students will graduate from Edison State Community College in May. Big Brothers Big Sisters is a non-profit United Way partner agency. Anyone who would like to become an event sponsor, donor, volunteer or learn more about how to make a difference in a child’s life may contact the local agency at 937-492-7611, 937-547-9622 or go to www.bigbrobigsis-shelbydarke.org for more information.